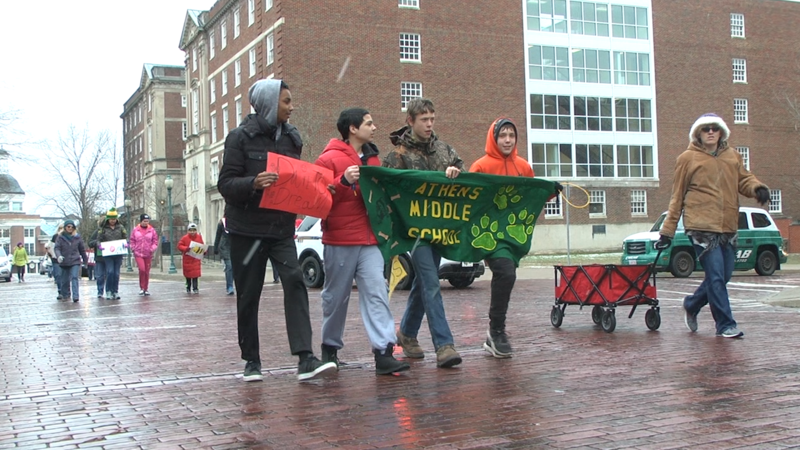 Marchers walk on Court Street during Developmental Disability Awareness month on 8 March. 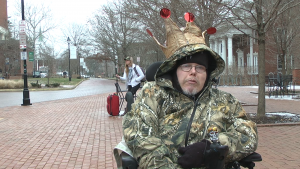 ATHENS, Ohio – The Athens County Board of Developmental Disabilities observed March as Developmental Disability Awareness Month to celebrate and empower those with developmental disabilities. Board Superintendent Kevin Davis said events like the march on Court Street, attended by more than 100 people, raised awareness in the community. David Dewey, one of the marchers with a developmental disability, said he marched because he wanted to show that people using wheelchairs aren’t confined to wheelchairs. David Dewey, 48, speaks on the importance of raising awareness about developmental disabilities. Autumn Brown, director of Integrate Athens, said Athens’ businesses have become more ADA accessible over the years because of events organized during the month-long celebration. Brown said that the events organized by the board have had a positive impact. He sites one example with Athens Public Transit where staff can secure wheelchairs on buses, assist those using canes and walkers, and generally help riders feel comfortable. That impact has led to an increase in clients, so the board modified the training for its personnel to keep up with the needs of those using their services. Previously, that training extended only as far as helping someone with their day. Now the board helps people plan their vacations, dreams and interests that suit them. The board also wants to help those with developmental disabilities travel on their own – figuring out transportation, locations and packing. These skills are crucial for them since others have planned their trips in the past. “Now it’s time for them to really explore it and learn themselves,” Perry said. The board also plans to open a co-op shop on Columbus Road within the next few months to sell products made by people with developmental disabilities.